Dubock Funerals can arrange all of the elements required for your loved one’s funeral, ensuring that it is a fitting tribute that reflects the wishes and requirements of your family. We offer a large variety of high quality products and funeral keepsakes to cater for a range of tastes, cultural and religious beliefs and financial requirements. Coffins and caskets – A wide range of beautiful solid timber and veneer coffins and caskets, to suit different tastes and personalities financial considerations, religious or cultural beliefs and environmental considerations. 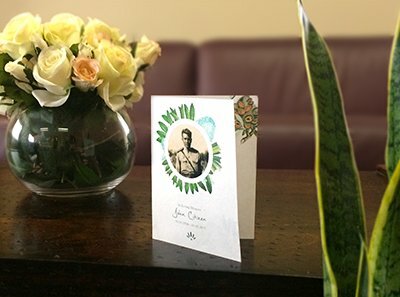 Funeral stationery – Customised order of service booklets, mass books, memoriam booklets, thank you cards, bookmarks, and santini cards. Floral tributes – A range of beautiful floral sheafs in varying arrangements, made from fresh flowers. Photographic Tributes – A professional photo presentation synchronised to a song of your choice for your loved one’s funeral service. Cremation urns and keepsakes – A vast array of cremation urns and keepsakes for families who wish to retain the cremated remains of their loved ones.